Ukrainian volunteers of the Myrotvorets Center, a Ukrainian NGO running an online database of personalities linked to Russian aggression, have shared a dump of a hacked email box belonging to a former member of illegal military formations of the so-called Donetsk People’s Republic (DNR), who owns a cryptocurrency trading platform. One of the email messages sent by an FSB operative informs that they “have approved the budget for the actions of the comedian” and orders to withdraw 200,000 (the currency isn’t mentioned, allegedly US dollars) and “hand them over as we had agreed,” another confirms the plan to fulfill it on the next day, one more email informs a local office of Zelenskyi campaign on the amount. Euromaidan Press verified the information. It turns out that the hack is most probably authentic, but it is impossible to completely verify the most compromising messages. On 7 April, NGO Myrotvorets Center published the fourth part of their “Operation Regata” alleging they have discovered and confirmed the fact that the campaign of the leader of the Ukrainian presidential race, Volodymyr Zelenskyi, was partially funded by Russia via a cryptocurrency trading site owned by a former pro-Russian mercenary in the Donbas. The proof came from an e-mail box on the Russian webmail service mail.ru, which Myrotvorets hacked and monitored for an unknown period of time. The NGO shared the dump of the email account so that anyone can check and validate the e-mail messages. Moreover, Myrotvorets provided videos showing the process of the validation of the messages which contain a DKIM e-signature and explaining how to validate messages when the email body was reformatted during forwarding. Sample headers of a signed email sent from [email protected] sent in 2017. A valid DomainKeys Identified Mail (DKIM) signature proves that the email was really sent from the claimed domain and its text wasn’t modified. This means that a properly signed message isn’t spoofed and wasn’t modified during its delivery. It’s not fully clear in which particular cases the Russian email provider mail.ru uses the DKIM, but its usage seems irregular. For example, the messages sent from [email protected] were signed with DKIM back in 2017, however, at least since August 2018, all the outgoing messages were sent unsigned. In 2017, Khavchenko moved to occupied Crimea where he established and headed the local office of the so-called “Union of the Donbas Volunteers” (SDD). In the second half of 2018, Khavchenko became an owner of a bankrupted cryptocurrency exchange BTC later renamed into WEX. Myrotvorets states that he acquired the platform with the assistance of the Russian secret service – the Federal Security Service (FSB). “My idea is to make Wex a platform for funding the unrecognized republics [of DNR, LNR, Transnistria, Abkhazia, and South Ossetia]. Our goal is fighting the dominance of the dollar,” according to Khavchenko’s explanation why he had bought the service as cited by the Russian service of BBC. The email dump contains correspondence dated starting from 2006 to 23 March 2019. And among the messages throughout the years up to 2019 were personal letters to friends and family members, confirmations of orders in internet stores, medical test results from a lab in Kyiv, lots of sent and received photographs from vacation travels. Newer messages contained DNR operational documents, photos, and personal details of members of the illegal armed formations in the Donbas. And the newest messages show Khachenko’s activities as an SDD leader. One of the addressees is [email protected], who signs his letters as Andrey Yurievich. Myrotvorets identifies him as Andrey Pinchuk (Yurievich is a patronymic, not the last name), an FSB colonel residing in Russia, who earlier worked in the “MGB of PMR” or “the Ministry of State Security by Transnistrian Moldovan Republic” and later as a “DNR MGB deputy minister,” according to Myrotvorets. The NGO states that the frozen funds of WEX were used to back FSB operations starting from late 2018 and that Khavchenko executes “immediately, fully, in full obedience” the orders of Pinchuk about managing the funds. Three above-mentioned messages dated 25 February 2019 contain what is allegedly an order to cash and hand over money to representatives of Ukrainian presidential candidate Volodymyr Zelenskyi for campaigning, confirmation of the readiness to execute the order, and notification one of the local offices of the amount of money. Message: The budget for actions of the comedian has been approved. Withdraw the first 200,000 to cash, hand over as agreed. Then we’ll consider by the results of the sociology. Message: Received. I will start the withdrawal of the crypto tomorrow, and it will go to that side during the [current] week. We have contacted the headquarters and the Mykolaiv office of the Zelenskyi’s campaign via email asking them to comment whether they had received the abovementioned message and how they interpreted it if they had. At the moment of publication, we have received no response. The article will be updated if we receive any comment. “Taking into account that the mentioned actions of the Russian special services which carry a threat for the security of Ukraine, we inform you [about the mentioned facts] for taking urgent decisions by the National Security and Defense Council of Ukraine, the Security Service of Ukraine, and the Verkhovna Rada of Ukraine. In light of the public significance of the information on the funding the campaing of Zelenskyi by the Russian special services and meddling by the aggressor country in the Ukrainian electoral process discovered by the Myrotvorets Center, the acquainted materials and the circumstances around discovering them have been published on the websites myrotvorets.news and ordilo.org,” reads the 7 April statement. There is no doubt that the hacked email box is genuine since the huge array of the email messages on various topics shows the routine correspondence of a person throughout more than 10 years. The messages contain lots of personal details, contacts, photographs, and documents. A number of the messages contain DKIM e-signatures and can be validated directly or after reformatting the base64-encoded message body to fix the mail.ru bug which can emerge when a message is automatically forwarded to another mailbox. We couldn’t independently verify the identity of Andrey Pinchuk and the fact that he owns the email box [email protected]. 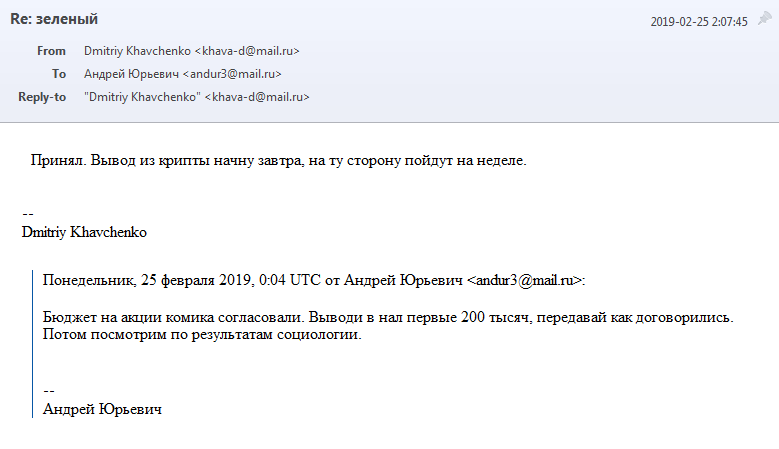 Unfortunately, the email-headers of the three particular messages allegedly showing the funding process don’t contain DKIM headers like many the letters by mail.ru, thus Euromaidan Press is unable to prove their authenticity. The absence of headers may be explained by the fact that the mail.ru server does not insert the headers into all emails – users should explicitly allow them in mail settings. 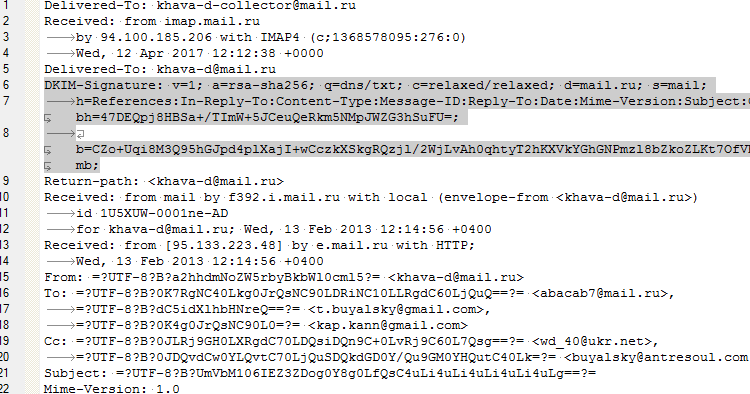 The DKIM-headers missing from emails sent from mail.ru doesn’t mean that the messages are fake. It just highlights the fact that we cannot verify them by checking their DKIM Signature. The box also contains messages which were sent and received within the period when the three mentioned messages were delivered, as well a month later on, up to 23 March. The newest non-spam or mailing list message is dated 15 March, and the most recent reply followed on 16 March. The two messages contain a routine conversation with a former DNR militant about his hardships after he finished his service due to a permanent disability owing to a combat injury, the militant asks for help and Khavchenko as a representative of a “DNR veteran organization” gives his an advice in his reply. Thus, the email address was used by its owner for at least two and a half more weeks since the date of the emails in question. The hacks are authentic, I checked them out. Seems like there could be only two innocent (for Ze) explanations: (1) Russia/DNR emailed this on purpose to discredit Ze's campaign, or (2) Myrotvorets themselves sent the email to Ze's campaign. Both unlikely, but must be checked. We cannot independently neither refute nor approve the pieces of evidence surfaced by the Myrotvorets Center. Only the SBU could make it all clear by checking the workers of the Mykolaiv office of the Zelenskyi campaign whether they were connected to receiving any cash money after the notification message was allegedly sent on 25 February, as well as the agency could check the email box whether it contained any earlier similar notification messages from other email address(es) and what was the reaction of them. Unfortunately, as of now, it seems unlikely that the SBU will conduct any investigative actions in the local office of the leader of the presidential race, Zelenskyi, to check the presence or absence of the suspected foreign meddling in the elections. However, we will follow the developments to monitor how the three security bodies will react to the letter by Myrotvorets addressed to them. The Myrotvorets Center NGO was earlier widely criticized by media and human right protection organizations, however, the criticism referred to the personalities Myrotvorets added to its database and wasn’t linked to the validity of the hacked documents the center had shared. In 2016, Myrotvorets published a hacked list of the journalists who received “accreditation” by occupation authorities of the so-called Luhansk and Donetsk people’s republics (“LNR” and “DNR”), Russian-run pseudo-states in the occupied territory of eastern Ukraine. G7 ambassadors to Kyiv in their joint statement expressed “deep concern” about massive disclosures of journalists’ personal data on the Myrotvorets website and urged on the Myrotvorets team to withdraw personal data from public access, Ukrainian President Petro Poroshenko joined the call, as well as local human rights organizations and, finally, the list was later removed. The list was discovered in a hacked email box by a “DNR” official. It contained real names, emails, and phone number by the journalists and was valid. Other portions of critics were against adding various Ukrainian politicians to the Myrotvorets database. For example, Mikheil Saakashvili was added when he illegally crossed the Ukrainian border as a leader of a 2017 campaign to impeach President Poroshenko. Though, the NGO wasn’t questioned about the validity of the hacked email dumps Myrotvorets had shared earlier. Only a few major Ukrainian media have reported about the information by the Myrotvorets Center on suspected foreign funding of the Zelenskyi campaign. Among them were TV channels NewsOne and Priamyi, the newspaper Fakty, internet media Bukvy, Gordon. Meanwhile, prior to the publishing of the haked email dump and the details, the pro-Russian Internet media strana.ua posted an article “Tree hollow for elections: Poroshenko volunteers are preparing a stove-piping of fake letters by Zelenskyi” based on a “Facebook post by a user Andriy Slyvka,” who suggested that Myrotvorets had allegedly registered a network of fake email addresses, “tree hollows” in his terms, to maintain fake correspondence between “politicians,” “FSB agents” and other fake addresses for a long period of time and then to imitate a hack and leaking of the fake messages. As we can see, this was pure speculation which has nothing in common with the leak that later followed. As of now, two of the addressees of the Myrotvorets letter commented on the accusations brought by the Myrotvorets Center against presidential candidate Volodymyr Zelenskyi and his HQ. As we mentioned above, the SBU speaker said that her agency has received the materials and examines them. Meanwhile, RNBO has informed that it doesn’t perform the operative and search activities and resent the Myrotvorets materials to SBU. The third addressee, Verkhovna Rada’s security committee, didn’t issue any statements yet. As well as there was no reaction from the accused side. Head of the “Union of Donbas Volunteers” (SDV) Alexandr Boroday has confirmed that Khavchenko’s email box was hacked. Though he calls the emails connected to the alleged funding of Zelenskyi’s campaign “a provocation of SBU.” Boroday heads the SDV while Khavchenko is a head of its Crimean outlet and Pinchuk leads its Moscow office. On 16 April, the SBU confirmed that it’s been examining the data published by Myrotvorets. – RBC’s investigation called Konstantin Malofeyev the real owner of WEX cryptocurrency exchange, though he himself denied it. Earlier Boroday worked as a PR manager of Malofeyev.